Image source: LuisTeodoro.com. Colorized courtesy of Algorithmia.com. Although the Batangueño national hero was a thorn in the side of the Americans at the turn of the twentieth century, and in fact was sent into exile for his refusal to take the oath of allegiance to the government of the United States in the Philippines, by 1912 that very same government had started to take a conciliatory stance towards the memory of Mabini. 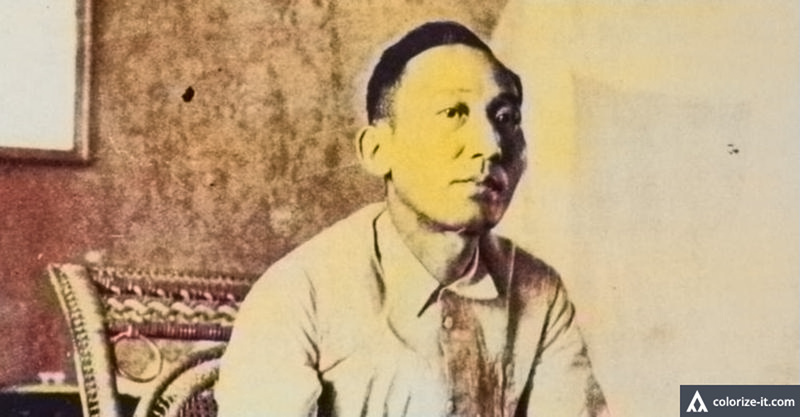 In fact, in 1912, by way of an executive order1, the Provincial Board of Batangas was given the authority to collect voluntary contributions for the construction of a monument in Batangas in honor of Mabini, who had died in 1903. 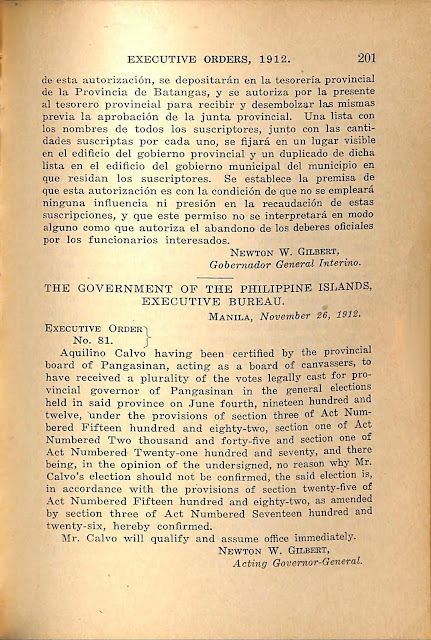 The contents of the executive order are provided below, with scans of the same in both English and Spanish following the text version. 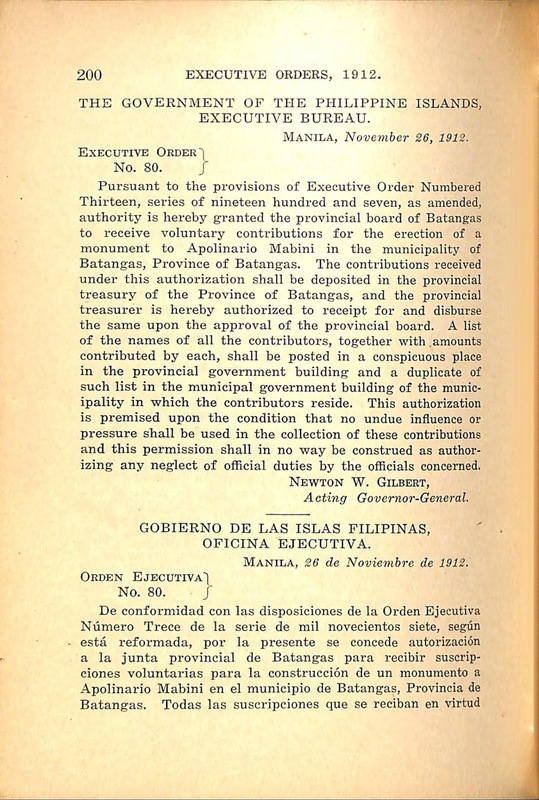 Pursuant to the provisions of Executive Order Numbered Thirteen, series of nineteen hundred and seven, as amended, authority is hereby granted the provincial board of Batangas to receive voluntary contributions for the erection of a monument to Apolinario Mabini in the municipality of Batangas, Province of Batangas. The contributions received under this authorization shall be deposited in the provincial treasury of the Province of Batangas, and the provincial treasurer is hereby authorized to receipt for and disburse the same upon the approval of the provincial board. A list of the names of all the contributors, together with amounts contributed by each, shall be posted in a conspicuous place in the provincial government building and a duplicate of such list in the municipal government building of the municipality in which the contributors reside. This authorization is premised upon the condition that no undue inﬂuence or pressure shall be used in the collection of these contributions and this permission shall in no way be construed as authorizing any neglect of ofﬁcial duties by the ofﬁcials concerned. Executive Order No. 80 series of 1912, English version. Executive Order No. 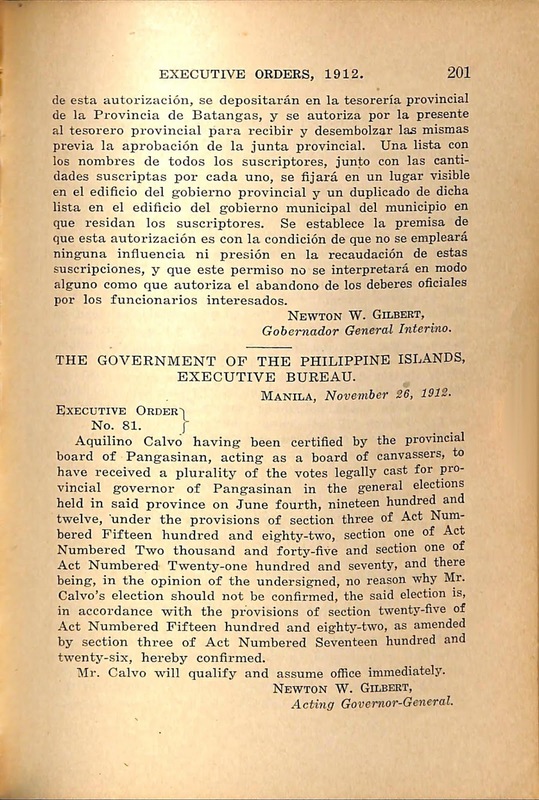 80 series of 1912, Spanish version. 1 “Executive Orders (1912),” online at the Internet Archives.